Oxford's leading hotel - The Macdonald Randolph - is situated in the heart of the city opposite the world famous Ashmolean Museum. Built in 1864 and recently refurbished, the hotel offers each guest the highest level of comfort and service in a traditional and welcoming environment. 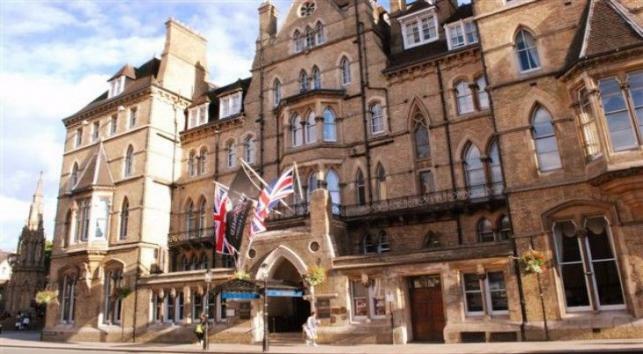 The location makes the Macdonald Randolph Hotel an ideal base for exploring the historic sights of Oxford or the thriving shopping centre just two minutes walk away. The Macdonald Randolph can provide you with excellent facilities for the ultimate occasion. We can play host to superb banquets and dinner dances from smaller gatherings to events with up to 220 guests. We provide a wide range of cuisine options to suit you. Elegance, communications and commerce meet at the Randolph Hotel, in the form of 6 conference and business suites accommodating up to 400 guests, equipped to the highest standards and managed by our expert events team. Located in the heart of the city, the Macdonald Randolph Hotel is the ideal place to stay for those who want to explore and enjoy the delights of Oxford. We offer each guest with the highest level of comfort and service in a traditional and welcoming environment. Our Macdonald Randolph Hotel in Oxford marries the most contemporary of business facilities with the most classic of settings.